I wonder what a first day of school looks like for you. I’ve been teaching for several years and have used the advice of one of my professors to establish the rules and boundaries very clearly, right from the beginning because it’s too hard to establish them later. But it doesn’t feel quite right. How do I plan for the first day of school? I had a professor who once told me the a very similar thing, although my youngest teacher-self didn’t necessarily interpret it in the same spirit he offered the advice. He meant I should be confident and purposeful, but all I heard were directives: I should give a list of rules so I would have better classroom management; I should give the grading policies on day one so there weren’t any questions later; I should tell the students all about myself so they know I will care about them. Some of my earliest colleagues reinforced my misunderstanding: show your class lists to other teachers to figure out how to avoid seating trouble-makers close to each other; give them a big homework assignment on the first day to find out who really wants to do well; try to scare them just a little. There are all kinds of problems with these recommendations, not the least of which is presupposition. They all presuppose and perpetuate some myth about classrooms and learning: that compliance and management are the same thing, that my word on grades is always final, that talking about myself is a student-centered activity. They all generate a dangerous misconception about students: there will always be trouble-makers; only kids who do their homework want to do well; fear will help them learn. A few years of clunky starts taught me a valuable lesson: there is a difference between the curriculum we talk about and the one we teach. I can write a beautiful syllabus that outlines perfectly all the expectations of the course, the grading policy, and the rules of the classroom. I can expound on a student-centered environment and mutual respect, but not make room to hear those voices on that very same day. 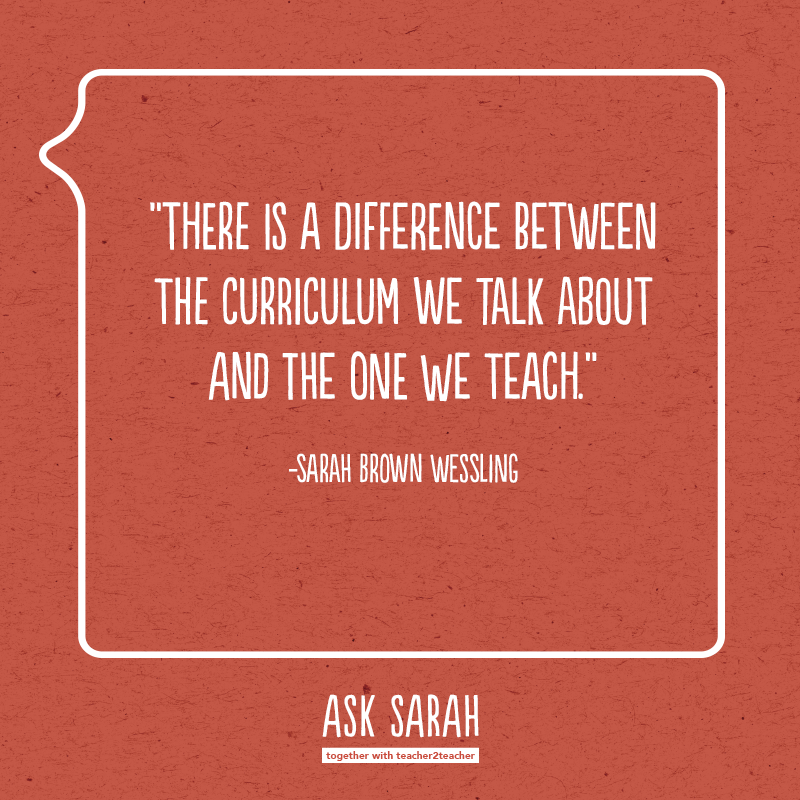 There is a difference between the curriculum we talk about and the one we teach. Students will walk away feeling their experience. And we’ll give them one. By default. Yet, we can be deliberate about the message that experience carries. On the first day, I don’t hand out rules or a syllabus. Instead, we sit on the floor, in a circle, and read an essay together: Plato’s “Allegory of the Cave.” Then I ask the students what our class is all about and they verbalize what learning will look like in room 506. I haven’t met you yet, but I’m already thinking about you. I’m wondering what you’ll be curious about and worried about. I’m wondering what will light you on fire and what you’ll teach me. There’s a very good chance I’m more excited about the first day of school than you are, but I want you to know why. I hope this pledge helps you understand why this first day and all the days that follow are so important. To see you as individuals. Not as part of a clique or group, not as the younger sibling or the child of well-known surname. I will work to see you. As you are, a work in progress, not a testament to past successes or failures. To listen to you. I mean really listen to you. So when I ask you a question, it’s not because I already know the answer. It’s because I’m curious about your brain and how it works. It’s because we’re having a semester-long discussion and your thoughts and experiences are just as important as anyone else’s and definitely more important than mine. To be human. This means I’m going to make mistakes. It means I won’t get it right every time, but I won’t be shy about owning it. It means I have three kids who sometimes have meltdowns or get sick or just need a mom and I won’t get those homework assignments read. It means that while teaching is undoubtedly my life’s work, it’s not the only part of my life. And this is good! Because it will remind me that your lives are just as complicated and imperfect as mine. That some days you won’t get it right and some nights you took an extra shift at work and slept through your alarm and didn’t get your homework done. It will remind me that for many of you “school” is a thing you do, and it’s my challenge to make it a place you find a better version of yourself. To work as hard as I ask you to. I promise I will. This doesn’t mean I’m going to make it easy or lay out all the steps to getting an A. It means that I’ll be a writer so I can be a better writing teacher. It means that I’ll read challenging things on my own so I can remember what it feels like to struggle and get stuck. It means I’ll stay up late and get up early and do everything I can to give you an experience every day. To not give you busy work. I’m serious. If I do, it wasn’t on purpose and you must tell me. You’re not going to hurt my feelings, I’m not going to penalize you and I’m not going to think any less of you. Honestly, I’m not interested in this game of papers and points. Everything we do should have a purpose you can believe in. To love you through it all. I know. It sounds over-the-top, but I mean it. I will encourage you and hold you accountable. I will celebrate you and have the toughest conversations with you. I will listen without judging, I will talk without withholding. I will laugh at your jokes and listen to your music. I will hear your stories, I will share my own and I will hold them all. To teach. Which is to say, I will be humble. That doesn’t mean I will be quiet, but it means I will be less important than your learning. It means I will abandon my ego and replace it with your best interests in mind. I haven’t met you yet, and already I know it will be an honor to have been your teacher. I am LOVING this pledge! And want to steal ALL of it. 🙂 I will take your idea and adjust for my truth and my soon-to-be students. Thank you! I’m so glad it’s a good place for you to start and then make it your own. Have a fabulous start to your year. Your students are fortunate, indeed. This was fantastic! I wish I started the year with this. Although I try to communicate these things at the beginning of the year – I think this is a much more effective way of communicating these ideas. I love the part about how you are human – I had an interesting experience this past week where I spelled something wrong on a powerpoint and a student was not letting it go – anyway this truly opened up an opportunity to talk about how I am definitely human and how we can offer grace to each other through our mistakes. It was a really interesting conversation, if only they knew how many mistakes I make on a daily basis that aren’t as visible! Most definitely human over here. I think you did so much more than take advantage of a good opportunity to talk about the kind of public mistakes teacher inevitably make. I think you opened the door to also talking about those less visible mistakes, the ones that really help us change opinions and connect new ideas; the kind that help us learn. Thank you so much for sharing and I hope you’ll let us know as these conversations continue to emerge! I’m a brand new teacher this year and love your pledge. I’m going to modify it to use with my Health Science students. Thank you for all of your wonderful knowledge that you share with everyone. I’m so glad this was helpful for you! Best to you on the first day. We’re so glad you’ve joined us in this profession! Thank you!!! I will use it as a template for my 3rd graders – it is my first year teaching and I am probably as excited and nervouse as some of my students. Thanks again!!! I’m so glad this was useful for you! Congratulations on starting your first year! There’s nothing like your first year; enjoy it! I’ve thought of doing something like this so your idea is great. I will borrow it and make so changes. I’m thinking on framing one copy in a visible place so I, too, can look at it and remember the pledge I made, particularly on the not-so-great days. Thanks. I’m so glad this found you just when you could use it. I love that idea of framing it and keeping it visible. I might have to steal that! Thank you so much for sharing this! I am going to use it, modified to my class, this year. As a first year teacher, I’m feeling as nervous about this adventure as I imagine my students may be feeling. I think this will help. Again, thanks.